The world’s continental shelves are dominated by sandy or muddy plains. These vast expanses of apparently featureless sediment are subject to constant sweeping by wave action. Small sediments are whipped up and suspended in the water column, creating turbid conditions that are poor for photosynthesis and vision alike. Mid-sized sands are moved steadily along the shore in the direction of the prevailing winds, creating delicately sculpted ripples parallel to the shore and tirelessly eroding beaches. The very largest pebbles and rocks are cast shoreward during fierce winter storms, dramatically transforming near-shore depth and bottom composition. 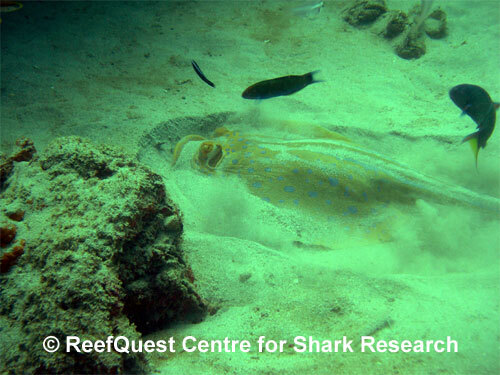 Blue Spotted Ribbontail Ray (Taeniura limma) excavates buried prey. These restless sandy plains offer few hiding places for predator or prey. Despite the turbidity, photosynthetic productivity here is high — carried out by bacterial and algal mats as well as by vast underwater plains of seagrasses. Seagrasses stabilize the sediments against wave erosion and provide both food and shelter for bottom-dwelling creatures. Beneath the seagrass roots and shifting sands, a weird and wonderful cornucopia of burrowing animals live silt-choked lives. All manner of clams, whelks, cockles, sand worms, parchment worms, amphipods, shrimps, mole crabs, brittle stars, and heart urchins dwell here, a bounty of seafood for those predators who can detect them and avoid being detected by still larger predators.